Twenty-six years ago, on 18 May 1991, astronaut Helen Sharman became the first Brit in space, and the first woman to visit the Mir space station. Dr Sharman beat 13,000 hopefuls to the post after responding to a radio advertisement requesting “Astronaut Applications. No experience necessary”. Sharman’s mission was, and still is, a remarkable moment for both British history and for women in science, technology, engineering and maths (STEM). It is also a timely reminder of the urgent need to promote and encourage girls into STEM careers. Two and a half decades on and achievements like Dr Sharman’s are still all too rare. In the UK, women make up just 21% of the entire STEM workforce (WISE Campaign, 2016, www.wisecampaign.org.uk). Meanwhile, there is a serious skills crisis across every part of the STEM sector with an estimated shortfall of 69,000 recruits every year. This is costing billions and putting the UK at a significant disadvantage, especially post-Brexit. However, we have a solution right in front of us: the tens of thousands of female students each year who are choosing not to pursue STEM careers. These girls are more than capable of contributing to the STEM sector – and the UK economy – but they are not choosing STEM careers. An education pipeline published by the WISE Campaign last year highlights the diminishing rates: 50% of girls do GCSE science, 34% continue into A-Level and just 7% go into higher education. That is in stark contrast to the 24% of boys at the same education level. Inspired by Space: Engaging Girls in STEM, published by Curved House Kids on the anniversary of Sharman’s launch, is a guide for teachers and educators that aims to not only engage primary-aged girls but also to embed a genuine and lasting interest in science. It provides easy-to-implement ideas for both the classroom and home learning. Written and compiled by primary educator and science specialist Claire Loizos with Curved House Kids publisher Kristen Harrison, it details five strategies to help girls succeed in STEM learning, including harnessing skills like communication, collaboration and creativity. Each strategy is accompanied by a number of adaptable activities for teachers to use in the classroom and beyond. The guide draws heavily on the learning and feedback from the Principia Space Diary, a primary science programme that now has over 90,000 British students registered to complete their own diary as they follow ESA astronaut Tim Peake’s Principia mission. 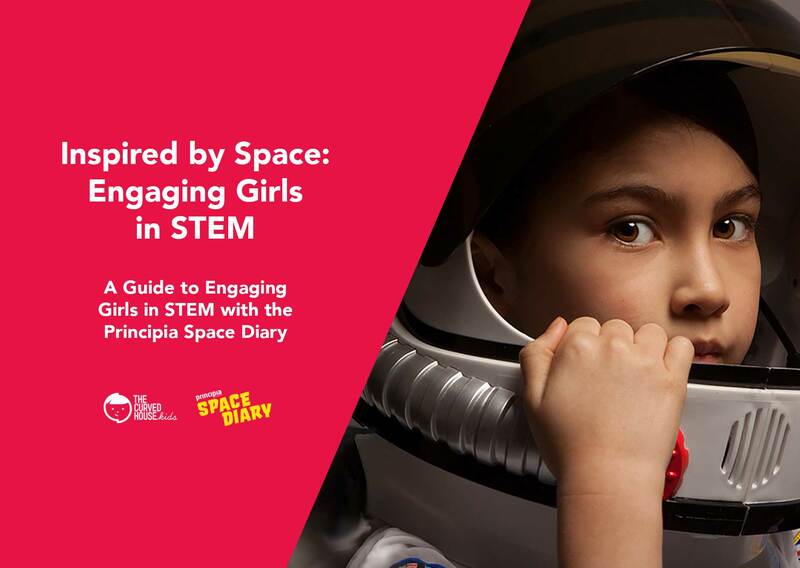 Developed by Curved House Kids with author and science communicator Lucy Hawking, the Space Diary highlights the roles of many influential women in the space and science sectors. These include Dr Helen Sharman, astronomer Sheila Kanani and Tim Peake’s Mission Director Berti Meisinger, who are featured in the guide. Our goal is to help primary-aged girls to see themselves in STEM careers – whether it’s as astronauts, scientists, mathematicians, coders or any other role. We also aim to ensure girls in STEM are visible and celebrated by peers, family and the wider community. Publisher Kristen Harrison stresses that this guide is not just for girls and promotes the use of these ideas with all students. Download Inspired by Space: Engaging Girls in STEM for free here. News outlets are welcome to make the guide available on their own websites. Please contact us at info@curvedhousekids.com for the Press Kit. Follow the conversation using #spacediary on Twitter. Claire Loizos trained as a Secondary Science teacher, and has taught in a range of secondary schools, including South-London (Deptford) and North-London (Wood Green). Having specialised in Primary-Secondary transfer she found herself working closely with feeder schools and primary school science teachers. As a consequence she decided to take a leap down to primary, becoming Head of Science at a Hertfordshire Prep. She is now leading science in a large state primary school on the Isle of Wight. Claire is a mum and a full-time teacher but she spends her free time running STEM clubs and promoting primary science and STEM learning opportunities, especially amongst young girls. Kristen Harrison is a former Penguin editor who founded the children’s education publisher Curved House Kids in 2011. She has a Masters in Communications and her primary interest is looking at how visual learning methodologies can help to raise literacy levels. She sits on the board of the International Visual Literacy Association and is the co-founder and curator of Visual Verse, an online anthology of art and words that invites writers to respond to a visual prompt. The anthology has featured new work by Ali Smith, Bernadine Evaristo, Andrew Motion, Adam Foulds, Nikesh Shukla and hundreds of other established and emerging writers.